Some picture books just have that “oomph;” that “wow” factor that blows you away the moment you open to the first page. 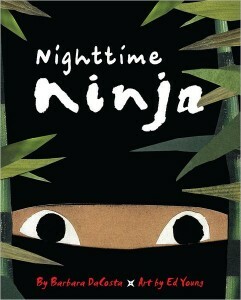 Nighttime Ninja, by Barbara DaCosta is one of those books. In Nighttime Ninja, a young ninja, crafty and brave, creeps through a quiet hallway on the way to his mission. He fears nothing; neither the quiet nor the shadows nor the importance of his mission. There is perhaps only one thing he fears…and he only faces it when the kitchen light comes on. Oh, what a lovely book this is. DaCosta’s text is super-brief, yet somehow manages to show both humor and imagination. It is even whimsical enough to whisk the reader all the way back to a lovely childhood, where everything was a mystery, everything was a fantasy, and everything–but everything–was possible. Yes, like a real ninja, Nighttime Ninja packs a punch. Artist Ed Young was apparently the perfect choice to bring the nighttime ninja to paper. His colors are deep and rich, and harbor all the mystery and excitement a little ninja craves. The layered illustrations are done in textured cloth, colored pencil, string and cut paper, and are so real, you feel as if you could reach right out and touch them. I just know you’re going to love this book. It’s a great lapbook for families with their own budding ninjas, and it would make the perfect birthday or Christmas gift from an older sibling to his/her baby-brother ninja. Also, public libraries or elementary schools that stock this book should carry several copies to avoid any controversy over whose turn it is to check it out. And one more thing: I usually give away the books I review, but every once in awhile I run across a book that excites my mind and cheers my spirits. This is one of those books. It was a hard decision, because I know a dozen “little ninjas” who would simply love this book. 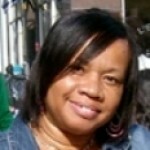 But I love it too, and I’m keeping it…until the day I have my own little ninja grandson to pass it too. Thanks, Little, Brown Books for Young Readers, for a memorable book. Best wishes, and…night-night, little ninja. Night-night.